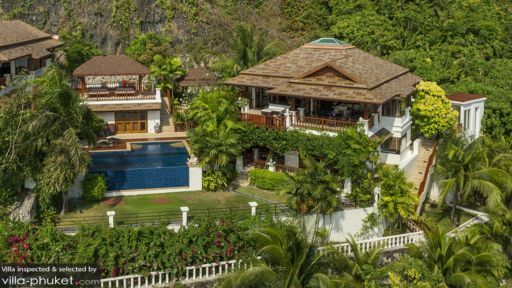 Villa Aranda occupies a prime hilltop location in bustling Patong, offering uninterrupted views out to the Andaman Sea and over the city. As part of the L’Orchidée Residence estate, the self-contained villa shares the compound with 24 other villas, as well as common entertainment facilities. Containing four bedrooms, the villa is ideally kitted out for groups of eight. Large groups will appreciate the versatility that Villa Aranda offers: two master suites are outfitted with king beds, and both guest suites feature twin singles that can be converted into doubles at request. There’s also a spare room with a single bed; this may be used as a fifth bedroom to house additional guests. While all bedrooms boast finely appointed interiors and private en suites, the master suites stand out with amenities like whirlpool tubs and balconies that open out to the garden. There are several pinch-me moments to be had at Villa Aranda’s outdoor compound - like taking a dip in the sparkling infinity pool, lounging under the shade of a Thai-style sala or getting a good soak in a bubbling jacuzzi tub. As a self-contained property, Villa Aranda offers exclusive usage of these amenities. Shared facilities located within the estate include a swimming pool, kids pool, gym, sauna, petanque court, pool table and entertainment amenities. Living spaces are spread out over two buildings within the property; the main villa contains the communal spaces, along with two master suites and a guest bedroom, while an adjacent building houses a guest bedroom and a spare room (this may be converted into a fifth bedroom to house additional guests). 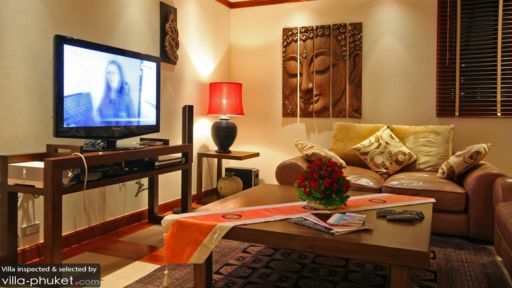 The décor features a blend of modern and traditional design elements; contemporary furnishings share the space with Thai artworks and figurines. The living area comes complete with sofas, a coffee table, 42-inch plasma TV with DVD player, satellite channels and sound system. The dining room, outfitted with a 10 seater dining set adjoins the living area. Meals may be prepared in a bright, airy open-plan kitchen fitted with a full range of cooking appliances. Airport transfers, along with housekeeping, security and personal guest assistant services are available for guests at Villa Aranda. Guests are also entitled to a free shuttle bus service that runs between your villa and the entrance of the estate. Baby cots and child minding services are available at additional cost, as are services like vehicle rental, private driver, laundry, in-villa massage treatments and in-villa dining experiences. Patong is the island’s tourist hotspot - there’s the beach, as well as a thriving nightlife and vibrant shopping and dining scene. While much of the town is a bustling hub of activity, your villa’s serene, hilltop setting is an oasis of calm, so you’ll feel like you’re miles away from the crowds. Patong Beach is about 10 minutes’ walk from your villa. The vibes here are busy, and you’ll easily rub shoulders with a diverse crowd of travellers. An array of dining and nightlife venues dot along the coast, adding on to the area’s lively buzz. Away from the beach, unwind with a spa ritual at venues like Aqua Spa (at Avista Hideaway) or Swissotel’s Thai Spa. Pum’s Cooking School is a great place to pick up culinary skills, but if you prefer one-to-one cooking lessons, your villa manager will readily assist with arranging in-villa cooking classes. Spend quality time with friends and family at Surf House, Flying Hanuman, Phuket Wake Park and Patong Go-Kart Speedway. Travelling with young children? Let them run wild and free at The Kids Club Phuket, a child-friendly venue equipped with facilities like swings, trampoline, crawling tubes, indoor soccer pitch and flying fox. We really enjoyed the beautifully presented Villa Aranda with excellent facilities. The views over Patong are stunning and the location is excellent for restaurants, shopping etc. Being close to Patong is not everyone’s choice but once in the villa you are well away from it. The huge open-plan living area is excellent, with a great terrace offering super views. The staff are good - from the security guards to the maids. This villa is excellent for large families, groups or two families travelling together. A family travelling with parents may appreciate the separate Annex. We revisited this villa recently, three years after our initial stay, and were impressed to find the villa in immaculate condition, and it offers even better views than before with a new extension added to the first-floor terrace. 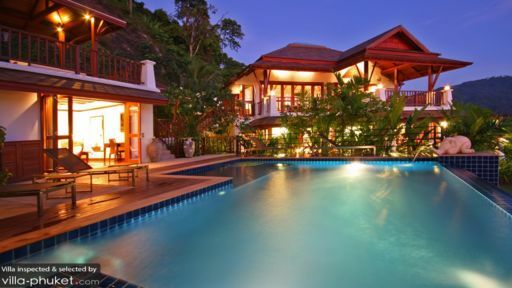 Lovely Villa in excellent location at Patong hill. We particularly love the terrace view & had 2 wonderful nights doing BBQ dinner there, enjoying the nice breeze & Putong night view (and even fireworks). Pictures on website live up to the expectation of villa in general. Special thanks to Audy (our driver) for driving us around in the few days! Thanks for your friendly service!